The learners will first navigate to the Padlet widget set up in the Moodle course and complete the activity. Then, they will be required to post a sample active learning activity that they can use in their classroom. The active learning activity will need to be specific to the content in which they teach. Next the learners will list (in parenthesis) what level of Bloom’s Taxonomy that the activity meets. Learners should develop activities that are not directly discussed within the course (discussions, choice, feedback, videos) and apply their content to the activity. In order for a learner to receive exemplar in creativity, learners should create activities that are available on the “Sample Activities” pdf (available in the Moodle course) or from outside resources. Learners can receive developed in creativity if they use an activity within the course (discussions, choice, feedback, videos), but change the activity so that it is not exactly the same as the ones posted. This activity is the foundation to the project the learners will complete in week 4 of the course. The web 2.0 tool Padlet has been set up for groups in Moodle. The learners will only see the Padlet that represents the cohort group they are in. The purpose of this is to make the posts easier to read and pull ideas from. The Bloom’s Taxonomy levels pdf is available to the learners in the Moodle course. All learners will have access to each cohort groups Padlet after the closing of the assignment. Appropriateness for Learners and Objectives: The activity allows users to develop and create active learning activities that they can apply in their own classroom. The main focus of this activity is for the learners to use prior knowledge, content, Bloom’s Taxonomy, and creativity to create their activities. 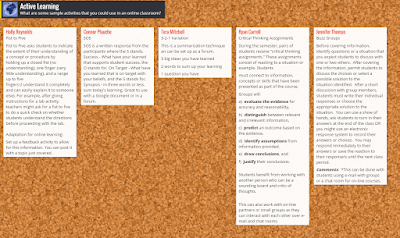 The visual representation of Padlet is like a corkboard where learners can post ideas. The learners are using what they have acquired in the course to complete this activity. Appropriateness for the technology: Padlet is a web 2.0 tools that is web based and can be accessed through www.padlet.com or embedded in an LMS. The initial demonstration of the tool (Padlet) will be available as a “how to” guide and video for learners who are not familiar with the tool. 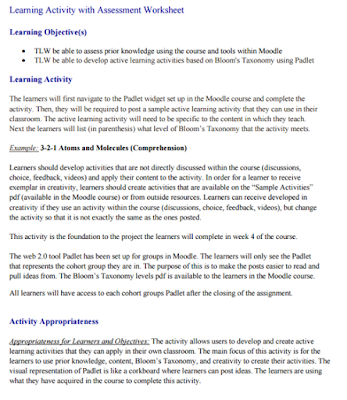 After the closing of the activity, the Padlets will be made available to all learners within the course (pdf). Padlet meets the ISTE standard “Facilitate and inspire student learning and creativity”, where teachers use their knowledge of subject matter, teaching and learning, and technology to facilitate experiences that advance student learning, creativity, and innovation in both face-to-face and virtual environments. The tool used for this activity, could be used for face to face, online, hybrid, or flipped classroom environments. Padlet offers an exceptional opportunity for learners to brainstorm, collaborate, and group ideas. Learners can use Padlet to brainstorm ideas for writing, explore lines of inquiry, collect research, for grouping ideas, and collaborating on group projects. Learners will be assessed using a rubric which focuses on Text Communication, Completion, Creativity and Overall Quality. Learners can receive Exemplar, Developed, and Limited in four areas depending on the depth of the assignment created.